Cut beef crosswise into 18 (1/8-inch-thick) slices. Place in large resealable food storage bag. Combine soy sauce, sherry, oil, and garlic in small cup; pour over beef. Seal bag; turn to coat. Marinate in refrigerator at least 30 minutes or up to 2 hours. Meanwhile, soak 18 (6-inch) wooden skewers in water 20 minutes. Garnish each skewer with 1 cherry tomato. Serve warm. 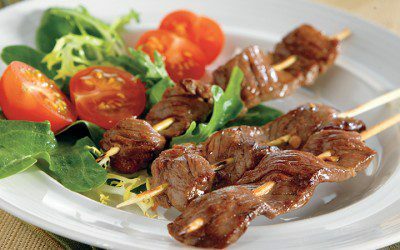 Serving size: 3 skewers (without cherry tomatoes and lettuce). Exchanges per serving: 2 Meat.